Nigerian security forces investigated areas near the site of two bombings that occurred in the past three weeks that killed 95 people in Abuja, Nigeria and detained 8 suspects. Security is high with the World Economic Forum being held in Abuja from the 7th through the 9th of May. Over 6,000 police officers and troops will be deployed to secure the conference. 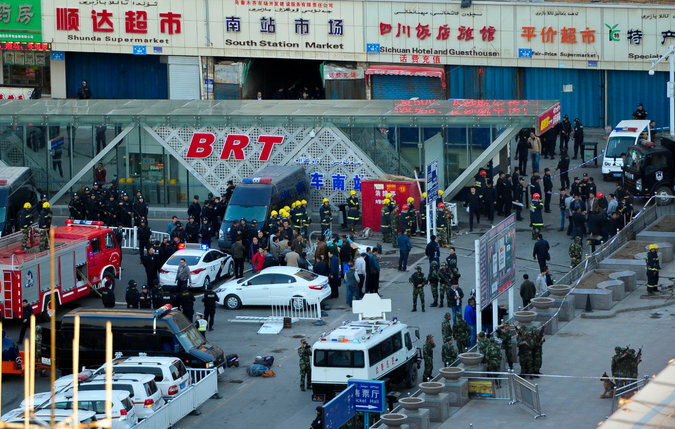 An unknown number of assailants, armed with knives and explosives, killed three and wounded seventy-nine outside of a train station in Urumqi, China. The attacks occurred at approximately 7:00 pm local time near the station exit and coincided with a visit form Chinese President Xi Jinping. A gas explosion in Florida’s Escambia County Jail late Wednesday night caused the building to collapse, killing 2 and injuring 100 to 150 others. It is unknown what caused the gas explosion. While the area had experienced heavy flooding during the past two days, it is unknown whether this contributed to the explosion.